Stripes have been popular for years now, with good reason – they’re simple enough not to be fussy, but they add a little polish to an otherwise plain piece of clothing. 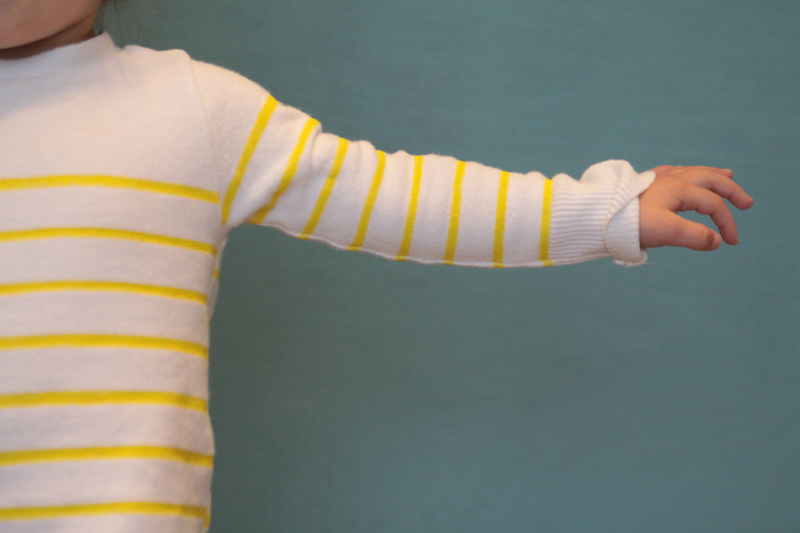 Stripes are SO EASY to add to any garment using masking tape and craft paint – here’s how I dressed up a plain white sweater for my daughter. Since I was also sewing together the sweater, I was able to add the stripes to each pattern piece separately, which simplified the process. 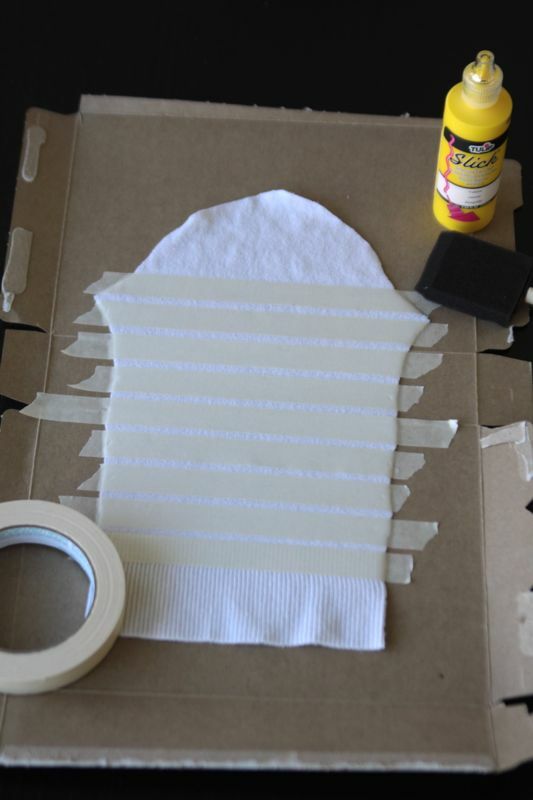 However, you could still do the exact same thing to an existing garment – just make sure you place a piece of cardboard in between the front and back layers before painting. Then paint the front, let dry, and paint the back (same process for the sleeves). I used masking tape to create my stripes – I just placed rows of masking tape across each pattern piece about 1/4 inch apart. 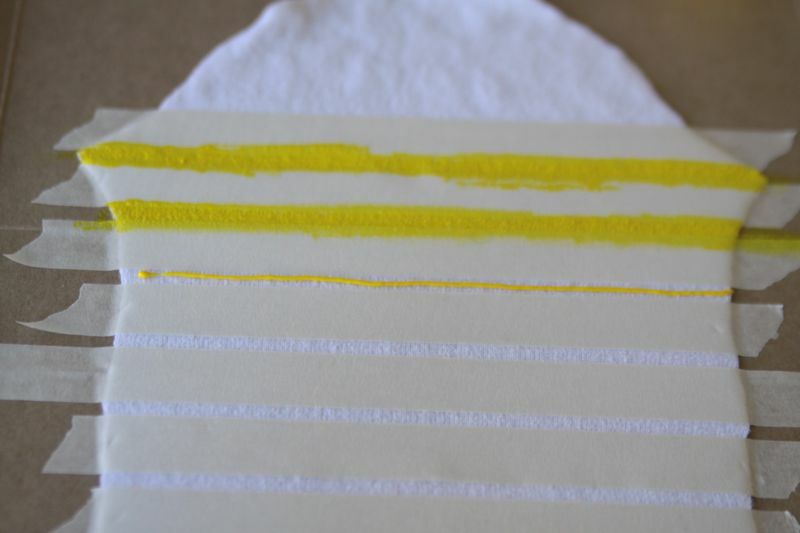 You could create any size stripes you like, but less fabric paint is generally better (keeps the garment from feeling too crunchy) so narrow stripes might be your best best. (ETA: to get rid of the crunchiness, just add textile medium – affiliate link – to your paint. After one wash all the stiffness is gone.) Also, be aware that the painted part of the fabric won’t have as much stretch once it dries, so don’t use this technique on something that needs to be very stretchy. I just squeezed a small line of paint across each untaped area then pounced it in with a foam paintbrush. I let the paint dry just a little, then removed the tape. That stretched the fabric out a bit, which was fine, because it sprung back into shape with a quick ironing (on the non-painted side). 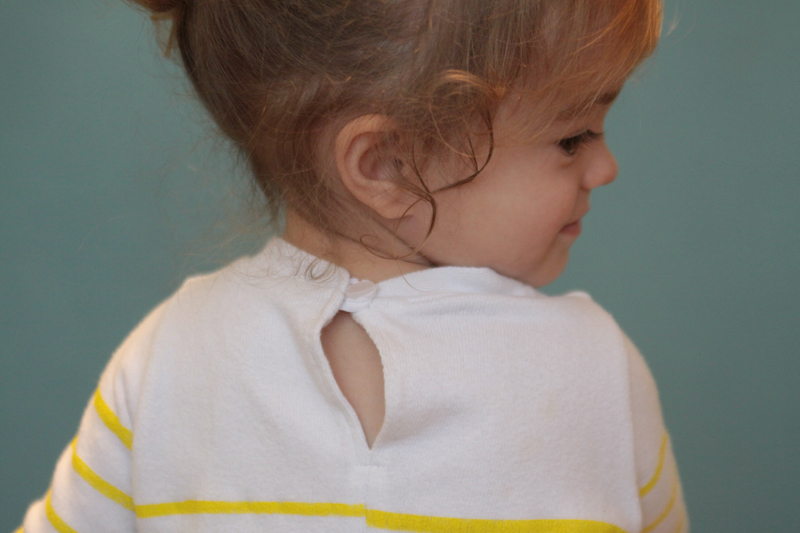 …and an elastic loop and button closure in the back (so the neckline wouldn’t have to stretch too much). The button came straight off the original cardigan – the neckline “ribbing” did as well. It was actually the finished edge of the cardigan down the front where the buttons were originally. 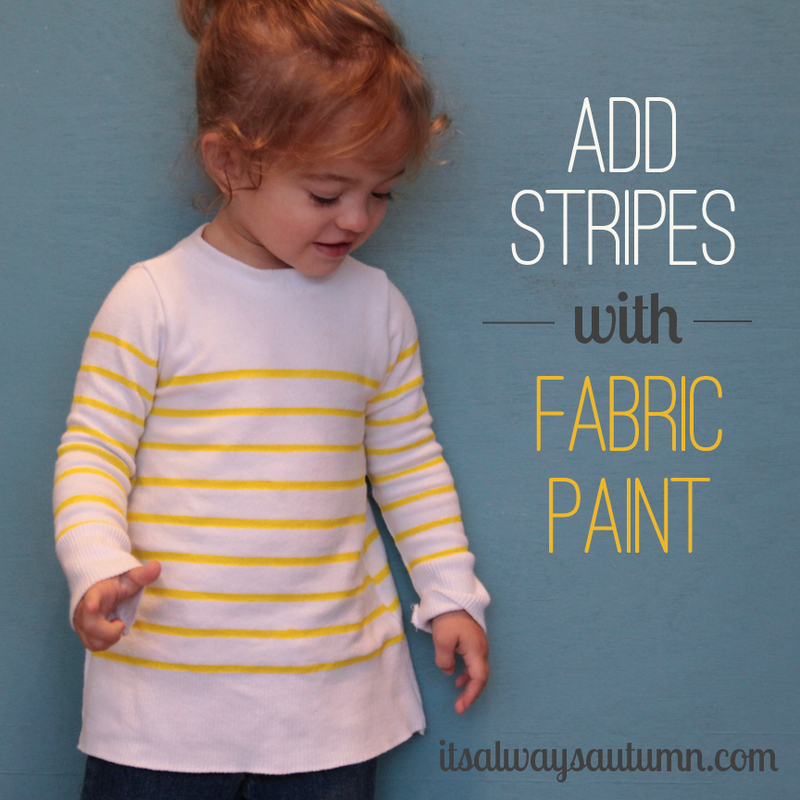 What a cute idea, I love stripes! How totally cute! 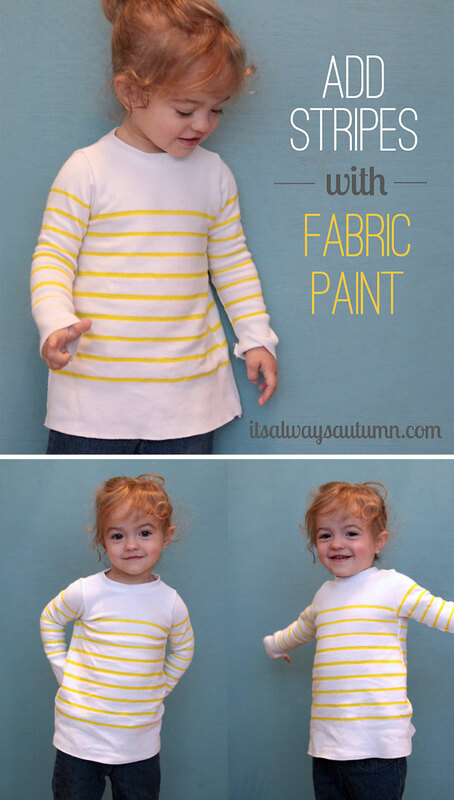 I have to remember this for upcycling clothes for my boys… a little bit of paint really does so much! What a fun idea! 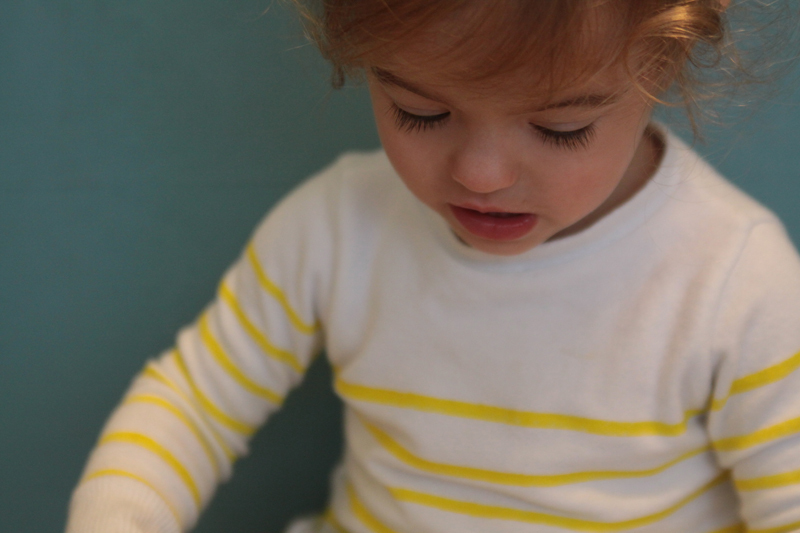 Your little girl is so adorable too!!! 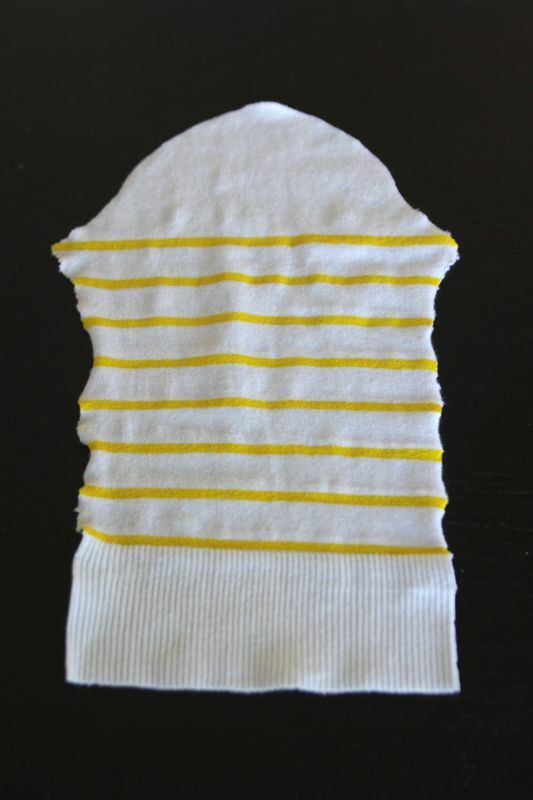 I love ho wou harvested elements from the original sweater to make the new sweater, like using the original front placket to make the new neckline. Would I be able to use this to add vertical stripes to a knee length dress? How have you been washing the sweater? Is it machine washable?